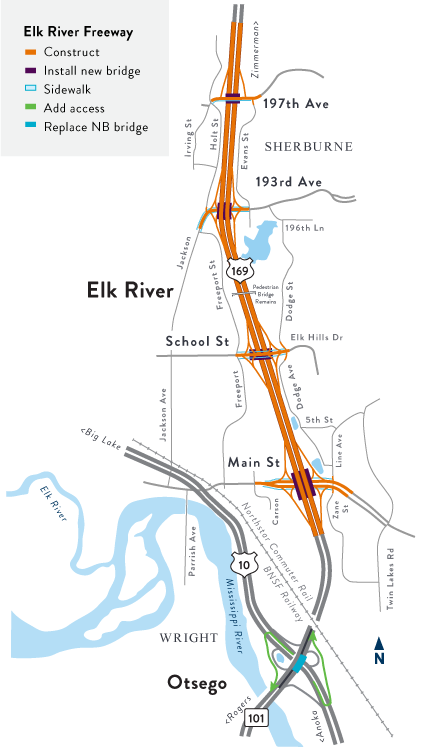 Reconstruct three miles of Highway 169 to a new freeway system through Elk River from Hwy 101/Hwy 10 to 197th Avenue, Sherburne County. Construction is tentatively scheduled to begin in 2023. Final interchange design to be determined. Examples: Cloverleaf, Partial Cloverleaf, Diverging Diamond, ect. MnDOT will also accelerate a project to replace the northbound Hwy 169/Hwy 101 bridge over Hwy 10. The estimated $3 million project will be advanced from 2025 to minimize travel disruption. All information is tentative and subject to change.